Down the Road is the latest anthology from Grey Oak Publishers, a book with 28 short stories about those unforgettable, warm, thrilling, and at times embarrassing memories of life in school and college campuses. Helter Skelter is running a contest for the same. Give it a try. You could win a copy of Down The Road! Urban Shots set the ball rolling for Grey Oak Publishers I feel – in the shot story segment – especially in and for the Indian society. Urban Shots was a major success and rightly so. And Down The Road is a good follow up. Focusing on the main theme of campus fiction, the book has 28 short stories, contributed by 16 authors, edited by Ahmed Faiyaz and Rohini Kejriwal. All 28 short stories revolve around growing up years in schools, colleges, universities and also forays into adulthood. Ahmed Faiyaz has contributed 9 stories, Rohini wrote 2, just like Ira Trivedi, Sneh Thakur, Paritosh Uttam and Malathi Jaikumar. The rest 10 authors have one story each. And they span the entire canvas of growing up years –from being in school, getting suspended for making trouble, harassing the teacher/professor, falling in love, falling in love with the teacher/professor, arranging illegal parties in hostel rooms, bunking college, getting ragged, falling in love, getting your heart broken, procuring a good placement, hanging out with friends, politics in college life, friendship, growing up, saying good-bye…oh the moments are unique and countless! It’s a wonder how all the stories bring back a certain part of life we’ve lived carelessly. Looking back, those moments seem more loved than present life- thanks to Down The Road. Quite a few contributing authors are first timers while most have shared and basked in the glory of Urban Shots. Yes this one indeed is an exciting and eclectic collection of short stories that brings out all those memories – unforgettable, warm, thrilling, and at times embarrassing – of life in school and college campuses. High on emotions and sensitivity, all the authors have portrayed different styles, ideas and narration techniques. *The Music Room by Ira Trivedi – the emotions portrayed touch your heart. *Welcome to St. Gibbs by Ahmed Faiyaz – a very relatable story, for most guys I’m sure! *That’s It? by Sahil Khan – the thing about his stories is that they might not be as unique overall – but the endings – boy! Does he nail it or what! It’s usually the last para or the last line of his story that makes it shine. And leaves behind a smile. *Call me biased but I do like Paritosh Uttam’s stories. Sororicide and Between Friends both of them are well crafted. *An Accidental Start by Kunal Dhabalia has a wonderful concept and it instills the idea of reading and writing in us. *Just A Moment by Nikhil Rajagopalan is very realistic. *Remember Me? by Ahmed Faiyaz again is a good one. *Bellow Yellow by Chinmayi Bali is very touching. Then of course are the articles and essays that paint features of campus life in our lives. Wait…am I almost jotting down all of them?! Sorry. Can’t help it – they all are fantastic and readable. This definitely goes up in my bookshelf along with Urban Shots – which can be read over and over again without losing any bit of their luster. So for kids in schools / colleges and even us – workaholics who sometimes are unable to spare a moment from our busy lives to reminisce the ‘good old days’, Down The Road urges you to take a while off and bring back memories to cherish forever. Enjoy it and treasure it. The road blocks (literally! ), due to Ambedkar Jayanti celebrations did not deter book enthusiasts from attending the book launch of Grey Oak Publishers’ new offering – Down The Road. An electic anthology of 28 campus tales by 16 authors brings back unforgettable memories of life in the campus. We all have had our share of school and college incidents that bring out emotions and feelings attached to the carefree life we truly miss now. And reviving those memories for the audience at Landmark, were the people who made the book a success. On the panel were – Ahmed Faiyaz, Sahil Khan, Paritosh Uttam, Rohini Kejriwal, Naman Saraiyawith me moderating the discussion. After a crisp introduction of the authors and the editors what followed was a lively dialogue with the famous five (as they would be known by now). The evening opened with a conversation with Ahmed Faiyaz – a renowned author with two popular bestsellers to his credit – Love, Life and All That Jazz and Another Chance; and of course memorable short stories contributed to Urban Shots. On being asked about the selection of the title, Ahmed spoke about how an online poll was conducted with a few options competing for the title position and how the most voted title was finally chosen. “Short stories are easier to write as well as read. When we were compiling stories for Urban Shots we had a few stories set in the campus life. So we thought of compiling just such stories that brings back memories of campus life,” smiled Ahmed on being asked about the ideation of compiling short stories. Paritosh Uttam, Pune based software engineer and the prolific author of Dreams in Prussian Blue as well as the editor of Urban Shots (and of course one of the authors of the anthology), spoke about his two short stories featuring in Down The Road. “One of them is entirely fictional and the other one is written from personal experience, but I won’t tell you which one that is,” blushed the soft spoken author. Naman Saraiya gathered most accolades from the audience, which of course comprised more girls. Need we get into details – nahh! We’ll let Naman’s “love” stories do the talking. His story, he said, is based on a friend’s encounters. Well captured and brilliantly put. Reminiscing about their campus life, the panelists shared a few experiences of their “good old days” and gathered a few laughs, trying to take a dig at each other. “Down The Road is sure to connect with each reader- be it an adult or a youngster. The entire collection brings out feelings and incidents that readers must’ve experienced at some point in their life,” affirmed Rohini and Ahmed as they spoke about the USP of the book. Wondering about what’s next in line from the desk of these brilliant writers -this is what we found out. Ahmed has his hands full -scripting “Another Chance” (for hopefully a movie tie-up) and working on another novel; not to forget, the next Urban Shots anthology – a “Love” collection. Paritosh too is working on his novel which possibly would be out this year. He is also contributing to Urban Shots Love Collection. Rohini, Naman and Sahil would definitely continue working together for TossedSalad.com as well as for Urban Shots further anthologies. We sure hope Sahil keeps his commitment to delivering a full fledged novel soon. The evening ended with a quick book-signing session by all present on the panel and the crowd hung around for quite a while, talking to the authors. All said and done, Down The Road is sure to strike a memorable chord in your heart. All you have to do is -read it! But most importantly – go pick up Down The Road and revive your campus days memories. This one is sure to “rock”! Oh and do not miss my essay on Page 209 – Fiction on Campus. This marks my debut as a contributing writer. From Kuwait to India via refugee camps; from being a Brand Manager and winning awards to now writing short stories by the beach and photographing the mountains, Sneh Thakur has lived quite an exciting life. I got talking and digging for more about this beautiful, chirpy and multi-talented lady. In a nut shell, tell us about Sneh Thakur. I would best describe myself in 6 words as: Pint Sized Rapunzel. On a Cloud. I’m 29 years old, born to a Rajput father and a Malyali mom – so dinner conversations were never dull! With 6 years of a career in FMCG under the belt in various leading FMCG companies in roles ranging from Sales, Business Intelligence, Innovation and Brand Management, I’ve travelled and explored India in a ‘real’ way which is one of the reasons why I love my job. My life-long loves have been of music that moves- U2, the lyrical quality of Jim Morrison and reading – A Fine Balance by Rohinton Mistry being my all time favorite. Is it true that you made your way to India travelling across refugee camps? Looking back, is there an experience you’d like to share with us? I was born in Kuwait and spent the first decade of my life there. When the Kuwait war broke out, the NRI community had to leave the country under difficult circumstances. It was at that point that my parents, who had every luxury in the world, had to bring me (then 11 years old) and my younger sister back to India. The journey involved travelling from Kuwait to Jordan on a long bus journey and camping as refugees in the deserts of Amman, Jordan till we got to safety and were flown into India. I believe in seeing the brighter side of life and remember an incident – it was midnight and the light from an innovatively created lamp (cottons wicks dipped in the remaining sardine oil from canned foods) lit the tent we were in and my sister and I spotted for the first time in our lives a Scorpion in the sand and almost picked it up. Thank god mom was close by! We all have a good laugh about “Deepti (my sister) and Sneh’s adventures in the desert” now. We also read about you selling candy on the streets of Howrah. Could you elaborate that account? My first assignment in the corporate world was as a Management Trainee for a major FMCG Confectionery company. I was based in Kolkata and as a trainee was expected to go through the learning ropes in Sales (due to which I am a better professional today). The first step involved starting from the scratch and seeing how “field sales” was done – so we could in time become better managers and leaders. This involved going to the market with boxes of candy and making sales calls – almost 55 to 60 shops a day. It was an amazing, tough experience but I must say that the shopkeepers in Howrah were very kind and generous and a smile was often enough to convince them! Would you like to share, with your readers, your tryst with writing? My tryst with writing started as a teenager when I’d keep a journal and play out with great drama my life, my friends and my angst at times! But in recent years I found myself turning to it very naturally as a form of self expression in blogging, notes, short stories, flash fiction and poems. In the corporate world you draft out oodles of memos and presentations every week, and I guess all the quick typing practice had to find a more creative outlet! Tell us about your stories in “Down The Road”. What brought about the ideation? I have written 2 stories in “Down the Road”. The first one is called “The Café with No Name” and is set in a Parsi café in Mumbai. When Ahmed Faiyaz of Grey Oak offered the opportunity for me to contribute, he mentioned that the tales had to have a campus connect. “The Café with no Name” is an off beat campus story revolving around the protagonist Dinshaw, a Parsi Café owner and the unlikely friendship that develops between him and a student who visits the café. As a student at SIBM, Pune I often used to travel in Pune and Mumbai for unique culinary experiences. This story is inspired by many a gastronomic delight! The 2nd story “Fresher” is set in Indore and is about a spunky girl from Delhi who lands up there and her experiences in settling in to her new life from school to college, a different city, being a fresher and dealing with the challenges presented in a brave, resilient way. For me, this was an important story to tell as I know of many young kids from cities who end up going to smaller towns very different from their cocooned city life and getting bogged down by ‘seniors’ and ‘introduction sessions’. For me the ideation on this was to inspire young college goers to be who they are and not worry about the rest. An exciting weekend for you would comprise…? A play with Naseeruddin Shah at Prithvi Theatre, Lunch at one of Bandra’s world class restaurants; Endless conversations with friends; the rain in Delhi, the smell of the scented earth after and an evening walk at Lodhi Gardens, and perhaps a boat ride and barbeque in Muscat, Oman! Read her stories in Down The Road and see the talent of this real Pint Sized Rapunzel. On a Cloud. 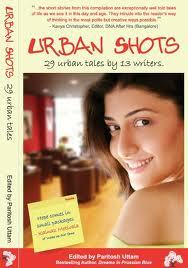 Urban Shots comprises 29 short stories by 13 writers (edited by Paritosh Uttam, who has also contributed 10 stories to the collection). The stories revolve around relationships, in urban cities (metros), as they exist today. Relationships not just amongst youngsters but relationships shared by married couples, an old father and his son (and daughter-in-law), friends, colleagues, and people overall. The stories talk about friendship, love, infidelity, hope, liberation, serendipity, angst, longing and a hoard of feelings that we sometimes don’t take time to notice. The best part is that you can read this book as per your convenience and not worry about dropping it mid-way to attend to other things. So if you are travelling or waiting at the bus stop or sipping coffee alone – this book guarantees to be your best companion. Paritosh’s stories are very crisp and brilliantly woven. They describe a certain instance or a day of a person’s life in a way that makes you visualize his/her (almost) entire life in a jiffy. I absolutely loved his writing. Ahmed Fiyaz has contributed three stories and all of them are a breezy read. The simple day-to-day tone and language used by Ahmed make the instances very familiar and relatable. Kainaz Motivala’s first published work of fiction – “Hope comes in small packages” is a very cute little story about a mother’s loss (of a child) and how she finds “hope”. Kainaz also is the face of Urban Shots. Malathi Jaikumar’s story – “Liberation” – revolves around the life of an uneducated rural woman (from South India) married to a man who later moves to the city; she bears two children and faces the wrath of her drunk husband every weekend –and finally one fine day she finds her way out of the assault. Her second offering, “Just average”, is about an otherwise average woman who shows extraordinary courage in a certain situation. Bishwanath Gosh’s “Morning Showers” is a crisp tale about infidelity. Simple and well written. His second story “Women in Love” shows an almost precise picture of how women in love behave. Abha Iyengar’s “Slow Rain” talks about a woman’s feelings of love and longing that have almost disappeared from her married life and her friendship with another man. Prateek Gupta’s “Apple Pies and a Grey Sweater” revolves around love and friendship just like Kunal Dhabalia’s “Love All” but his “Driving Down the Memory Lane” treads the fine line of infidelity. Sahil Khan’s “The Untouched Guitar” is extremely refreshing. Though what feels like a regular story told by a youngster recalling life through college years – the last line is what brought a smile to my face. And if I may add – it’s Kick A** !!! Vrinda Baliga’s “Stick Figures” is a very touching tale and so is “Dialects of Silence” that peeps into the life of an Indian woman. Rikin Khamar’s “The House in Alibagh” is a bit mystical and different from the rest. Naman Saraiya’s “Trial and Error” makes up for a quick yet engaging read. This collection of part-fiction-part-real stories makes up for a great start by Grey Oak Publishers. The new young-age writers have shown a knack of keen observation of human tendencies and behavior in today’s fast-paced life, especially in the metros. We no longer think twice before indulging in extra marital affairs or living in the fast lane where loving someone a moment ago and dumping them the next doesn’t really bother us. Instant gratification is what rules our behavior and preferences nowadays. Emotional attachments barely exist. Reading this book made me wonder about the sea-change in perception we have undergone in the recent years. Aren’t we somewhere down the line losing the real essence of words like – love, sacrifice, marriage…? We are not the ones to judge a certain thing as “right” or “wrong”. What appeals to us in a certain moment is what we indulge in. No time for deeper thoughts – or the consequences that follow. Overall, a great attempt and a good read. I highly recommend this one.